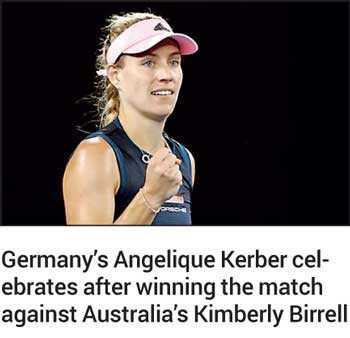 MELBOURNE (Reuters): Birthday girl Angelique Kerber thrashed Australian wildcard Kimberly Birrell 6-1 6-0 to reach the fourth round of the Australian Open yesterday and complete a late-night horror show for the locals at Rod Laver Arena. On the day of her 31st birthday, the German former champion has enjoyed a stellar start at Melbourne Park and 240th-ranked Birrell had nowhere to hide in front of a packed centre court crowd. The match followed Rafa Nadal’s straight sets demolition of Australian number one Alex De Minaur. Roaring through the first set in 27 minutes, Kerber’s procession was held up briefly as Birrell saved three match points. Yet the former world number one made no mistake on the fourth, rushing forward to hammer a forehand winner down the line to set up a clash against American Danielle Collins.